I drove to a customer's vineyard yesterday to do some scouting as Japanese beetles have been incessantly pesky this year. 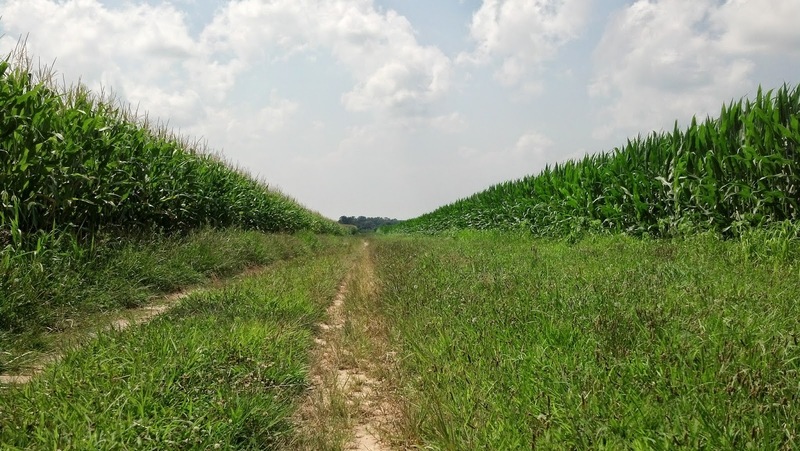 As I drove up the back lane it dawned on me that I had the perfect image and topic for a blog, one that I've mentioned in the past, and that is of the coexistence of both biotech and organic crops. Perfect example of organic and biotech crop coexistence. The right is organic corn. The left is biotech corn. They cannot "drift" or "contaminate" each other, read on to find out why. In the rhetoric of social media, you wouldn't know it, but along the back roads of rural America, biotech and organic crops get along, and so do their farmers (at least the ones I know). I love living and being neighbors in the farmland of rural America. We hear the "noise" of social media, but it doesn't usurp our world. Our world is open, quiet, and peaceful. Neighbors still know each other and wave as they pass by. The polarization of our food and farming systems is on our phones, our iPads, our TVs, our laptops, but not in our fields. This farm is not mine as I've written before, we no longer farm organically. It is the farm of a landlord I know who is not a farmer. He leases the farm out to different farmers, and it just so happens that one is certified organic and the other is conventional. You wouldn't know this if you passed by the farm. There's no billboard or signage announcing one or the other. There are no battles or controversies surrounding these fields. There is just peaceful coexistence. I know because I personally know the landlord and the farmers. Just 2 farmers farming the land and trying to make a living doing what they love. So why can these 2 corn crops coexist? So you're still wondering why this organic farmer would risk putting his corn next to the biotech farmer right? (Or vice versa as the case may be). 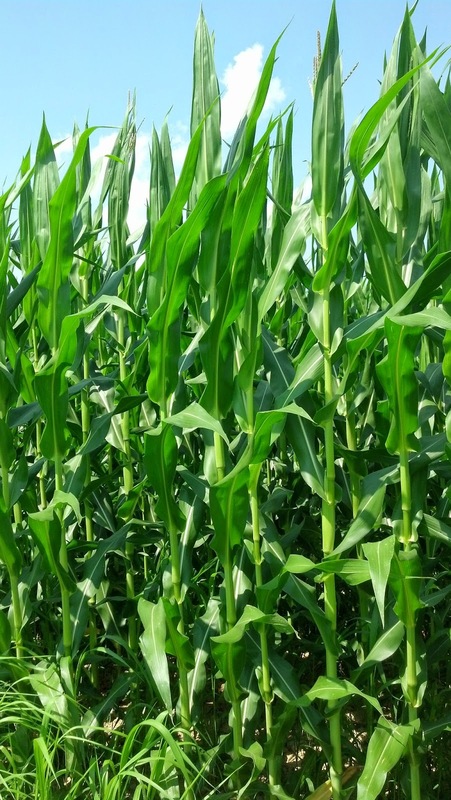 Organic corn not yet having reached pollination. This organic corn is not in pollination stage yet. There are no tassels and there are no ears of corn with silks yet. 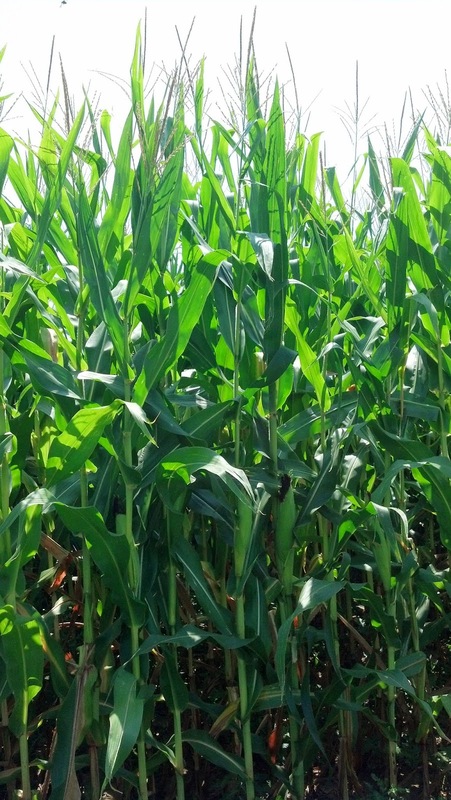 There is no way for the biotech corn to pollinate this organic corn because 1) the biotech pollen is gone, this corn is well past pollination, it has no "male sperm" so to speak, 2) the organic corn has no ears of corn so no "female" parts by which to receive the "male" pollen. So to be biologically correct, the male pollen just like sperm, has a short life. Once released, it is only viable for 18-24 hours. Pollen is not able to reproduce indefinitely. So once the silks on the ear have dried up, the pollen is pretty much past its ability to contribute to reproduction. Given the different stages of growth these 2 fields of corn are in, it is biologically impossible for them to "drift" to one another. That's the management of field planning, something all we farmers do. Coexistence is an extremely manageable situation and happens more often than you are lead to believe by the media. We practiced organic, conventional, and biotech farming systems simultaneously for 7 years and continue to do specialty seed production which still requires the same level of management to ensure purity. That's all coexistence is, management and planning. So despite what you may hear in the media, know that it is very doable and happens often. We farmers have been managing it well despite those who would lead you to believe otherwise. 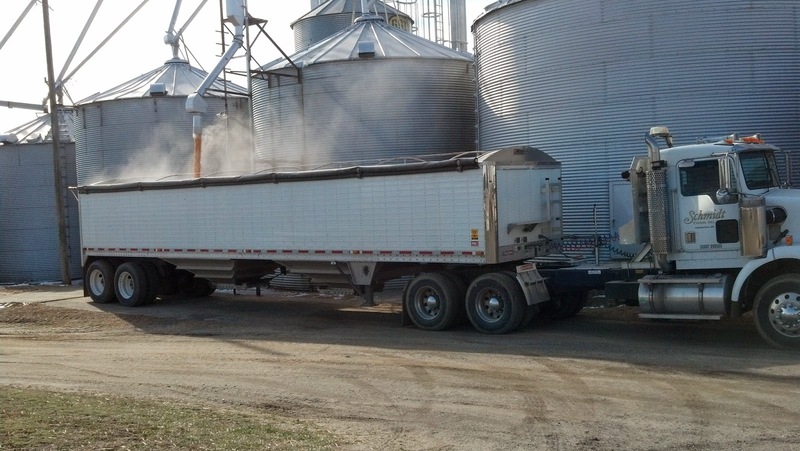 Likewise, when we have specialty grains or seeds, that needs storage, we clean, then we clean, and then we clean some more. 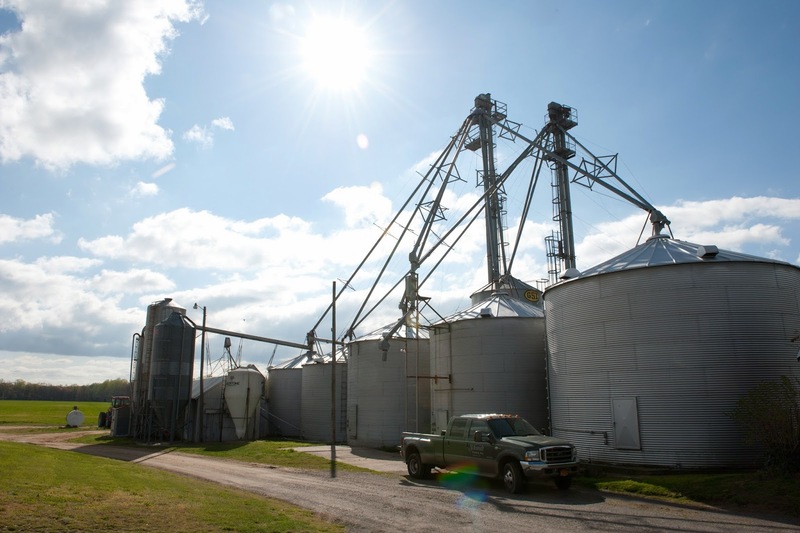 We clean what I refer to as our farm "infrastructure", the grain tanks, the grain trailer, the seed carts, the planters, the combine, anything that comes in contact with multiple crops that need to be kept segregated. Again, tedious work but simply just a management tool to allow for coexistence of commodity crops with specialty crops, those that need to be kept segregated from the rest. We recognize that there are pros and cons to all types of farming. There is no "one" best farming system that is without flaw. There is no "one" cookie cutter system that all farmers should universally follow because we all have different soil types and microclimates that impact what and how we grow. But know that we do respect each other, coexist with each other even when we farm with different methods. 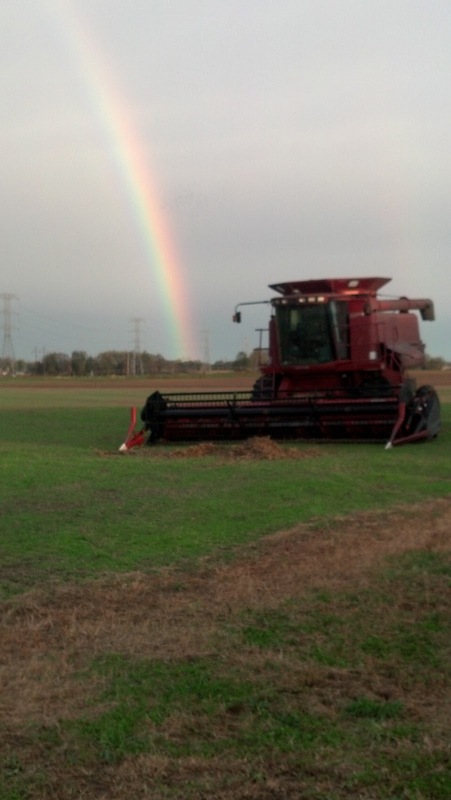 We farmers coexist and so do our crops. The world would be a better place if others followed suit.